The project will extend services now offered through the Student and Family Resources Office at Mary Herbert Education Center. It also will supplement the Food for Students Program, which provide food for students on weekends and school breaks. Heather Wagner, Student and Family Resource specialist for the district, is working with EHS Principal Britton Hart to acquire the needed items and arrange for long-term financial support through grants and donations. Protocols will be established to assure confidentiality for students who need assistance. Students will be referred to the services by staff members and through the enrollment process. 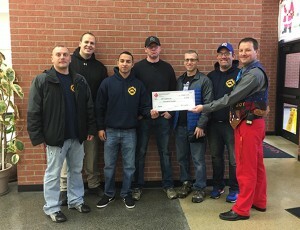 Today, the local firefighters union presented a check for $750 to district representatives to purchase needed supplies. Earlier this month, the Emporia Board of Education accepted a donation of washers and dryers from two Emporia families this month. other individuals and civic organizations are making contributions of cash and supplies for the pantry shelves. She estimates the pantry will assist a minimum of 30 students through this school year. Grant applications are being submitted to pay for the food and other supplies needed to keep the project going on a permanent basis. Anyone who is interested in learning more about the Spartan Stop or making a donation can contact Wagner at 341-2392 or by email at heather.wagner@usd253.net.